The Wellington Hotel is located on Seventh Avenue at 55th Street in the very center of Midtown Manhattan, just steps from Broadway, New York’s celebrated Theatre District, and other performance locations, such as the world-famous Carnegie Hall and New York City Center. A leisurely walk quickly takes you to Central Park, MoMA (the Museum of Modern Art), Lincoln Center, Rockefeller Center, several museums and many shops and restaurants. The Wellington Hotel is just one short block from the lights of Broadway and within easy walking distance to all Broadway theatres. No first-time visit should miss a Broadway performance. While some shows seem to last forever (Phantom of the Opera, Wicked, The Lion King all quickly come to mind) some have been on stage more than once (Cats, Chicago, Hello Dolly). Our City Experts desk, located on the 55th Street side of the lobby, can assist you with purchasing tickets to all Broadway and off-Broadway shows. In the spring of 1887 Andrew Carnegie and his new wife, Louise Whitfield, were on their way to Scotland for their honeymoon when they met Walter Damrosch, the 25-year old conductor of the Symphony Society of New York. Their discussions about a new concert hall in New York led to the legendary Carnegie Hall with its main entrance on 57th Street just east of Seventh Avenue, about a two-minute walk from the Wellington. With more than 42 million visitors each year, Central Park is the most visited park in the United States. Established in 1857, the 778 acres of Central Park are owned by New York City. Home to the Central Park Zoo, Central Park Carousel, The Boathouse, Tavern on the Green and Strawberry Fields, the Park is under the management of The Central Park Conservancy. The Park hosts Shakespeare in the Park and free concerts by the New York Philharmonic and others. Walk to Central Park in under five minutes. Creativity, openness, tolerance and generosity are celebrated at The Museum of Modern Art. Located just three short blocks from the Wellington Hotel at 11 West 53rd Street (between Fifth and Sixth Avenues), MoMA offers thought-provoking modern and contemporary art. In addition to art and exhibitions, MoMA offers dining options which include Café 2 (casual, family-friendly offering seasonal Italian food), Terrace 5 (a full-service café) and The Modern, a member of the Union Square Hospitality Group with a separate entrance on West 53rd Street, overlooks the Abby Aldrich Rockefeller Sculpture Garden. Home of the Rockettes, Radio City Music Hall is the largest indoor theatre in the world. 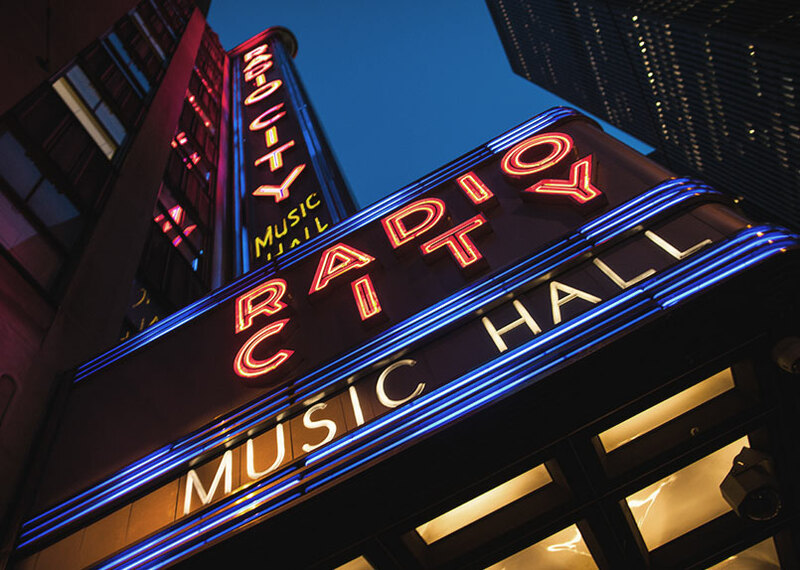 Granted official landmark status in 1978 and extensively restored in 1999 at a cost of more than $70 million, each of Radio City's 6,015 seats is often filled by performances of the Rockettes, including the world famous Christmas Show. Consider the Stage Door Tour. All this is just a five-minute walk from the Wellington. Even when it is 90 degrees in the City, we are thinking of The Tree Lighting. Yes, in capital letters...and held the Wednesday following Thanksgiving The Tree Lighting is an event not to be missed. Created by John D. Rockefeller, Jr. as a 'city within a city' Rockefeller Center is home to a variety of retail, dining and entertainment venues including Top of the Rock Observation Deck, Radio City Music Hall, NBC Studios and the glorious Rainbow Room it is just a short stroll (five blocks) from the Wellington Hotel. Completed in 2003 on the site of the New York Coliseum, the Time Warner Center is two 750 feet towers connected by a multi-story atrium of retail shops. The 2.8 million square feet is occupied by office space, residential condominiums and the Mandarin Oriental New York Hotel. The shops at Columbus Circle occupy the curving arcade at the base of the building. The Time Warner Center is a walk of less than ten minutes from the Wellington Hotel. Lincoln Center for the Performing Arts is a 16 art and entertainment acre complex created as part of the urban regeneration project for the Lincoln Square area of New York City. Constructed between 1959 and 1966, Lincoln Center houses 30 of New York City's most famous arts and cultural centers including Alice Tully Hall, Damrosch Park, David H. Koch Theater, Mitzi E. Newhouse Theater, Vivian Beaumont Theater, David Geffen Hall at Lincoln Center, Metropolitan Opera House and Rose Theater. Lincoln Center is home to the New York Philharmonic, the Metropolitan Opera and the New York City Ballet. Stay in the very center of New York City - in the heart of its bright lights and bustling, big city streets, vibrant arts and rich culture. We put Manhattan in the palm of your hand! And it’s at The Wellington Hotel.